Combined with corporation records and documents such as news releases, this post on the MoneyMakerGroup Ponzi forum raises questions about whether AdViewGlobal, an autosurf with close ties to AdSurfDaily, was part of an elaborate penny-stock scheme and money-laundering conduit that consumed the EWalletPlus payment processor and left AVG members holding the bag. EDITOR’S NOTE: Longtime readers of the PP Blog will recall that the purported AdSurfDaily (ASD) spinoff known as AdViewGlobal (AVG) and some of its members engaged in particularly bizarre behavior in May 2009. The absurdities included announcing (and then unannouncing) a puported deal with a new offshore wire facilitator, announcing (and then unannouncing) a new website with purported new services and claiming the upstart company was healthy enough not only to pay out 250 percent matching bonuses to members and 200 percent matching bonuses to recruiters, but also to pay out multilevel downline commissions and purported surfing income of up to 8 percent a day. Just two months earlier — in March 2009 — AVG suddenly announced its account at an unspecified bank had been suspended and that its chief executive officer had resigned. The firm bizarrely added that CEO Gary Talbert would not leave the company altogether. Rather, Talbert would remain in the accounting department. Just a month earlier, Talbert, also a former ASD executive, had been introduced in an AVG conference call by Terralynn Hoy, an ASD member and moderator of the pro-ASD Surf’s Up forum and an emerging forum for the AVG autosurf. The introduction occurred in February 2009 after weeks of assertions by AVG that there were no ties between itself and ASD. The introduction was preceded by a bizarre announcement in late January of 2009 by AVG that the appearance of its graphics on an ASD-controlled webroom was an “operational coincidence.” The person making that announcement on AVG’s behalf was Chuck Osmin, a former ASD employee. AVG’s websites ultimately disappeared. Members claimed AVG was owned by George and Judy Harris, and at least one of the AVG websites identified George Harris as an AVG trustee. George Harris, described in court filings as the head of ASD’s purported real-estate division, is the stepson of Andy Bowdoin and the son of Bowdoin’s wife, Edna Faye Bowdoin. It later proved to be the case that May 2009 — the same month in which AVG was reimagining itself as one of the world’s leading advertising and communications firms while at once announcing and unannouncing key bits of purported news — was the same month the grand jury that indicted ASD President Andy Bowdoin had convened. The PP Blog is reporting today that records strongly suggest AVG was a cog in a larger fraud — one that somehow married the AVG autosurf to a penny-stock scheme with a purported arm in the “oil” businesses and a branch that owned an Arizona payment processor known as EWalletPlus that later collapsed. Here, now, our Special Report . . .
Is stock manipulation in multiple venues part of the bigger picture of the AdSurfDaily Ponzi scheme? Out of the clear blue sky in the fall of 2008 — as ASD awaited a critical court ruling in the Ponzi forfeiture case against the assets of President Andy Bowdoin — ASD claimed it expected a $200 million revenue infusion from Praebius Communications, a penny-stock firm that did not disclose audited sales figures. But the Praebius announcement, which ASD later withdrew without explaining why, may not be the firm’s only tie to a penny-stock company. A May 2009 post on the MoneyMakerGroup Ponzi forum is adding to lingering questions about whether AdViewGlobal — an autosurf with close ties to ASD — was part of an elaborate penny-stock scheme and money-laundering conduit involving multiple companies, domestic and offshore venues and individuals with ties to ASD. On May 5, 2009, a MoneyMakerGroup poster who used the handle of “IMCanadian” claimed he (or she) had received autosurfing payouts totaling $1,300 from AdViewGlobal (AVG) on unspecified dates. The payments, according to the post, were routed through SolidTrustPay (STP), a Canadian payment processor. The MoneyMakerGroup post potentially provides a glimpse into how fraudulent securities businesses may layer themselves to confuse both investors and authorities. The post cites two different email addresses as the sources of STP payments from the AVG scheme. Although the email addresses purportedly were used by AVG to cause STP to issue AVG autosurf payouts, neither of the addresses used a domain name owned by AVG. Instead, they used Yahoo and Gmail addresses. AVG, according to records, could have chosen to use email addresses that corresponded to its own domain names. The firm owned at least two namesake domains before it suspended member cashouts in June 2009: ADVGlobal.com and AdViewGlobal.com. “Most if not all of your leaders are joining,” the promoter flatly counseled on a forum known as FreeLunchRoom on Dec. 23, 2008, two days before Christmas. The MoneyMakerGroup posts that followed cited not only the Yahoo and Gmail payout addresses, but also two different STP usernames from which AVG payouts to “IMCanadian” purportedly originated. Absent in both usernames was any reference to AVG itself. Like AVG, ASD also used STP, according to records. In August 2008, the U.S. Secret Service alleged that ASD had wired “several million dollars” to STP just prior to the seizure of tens of millions of dollars from the personal bank accounts of ASD President Andy Bowdoin. 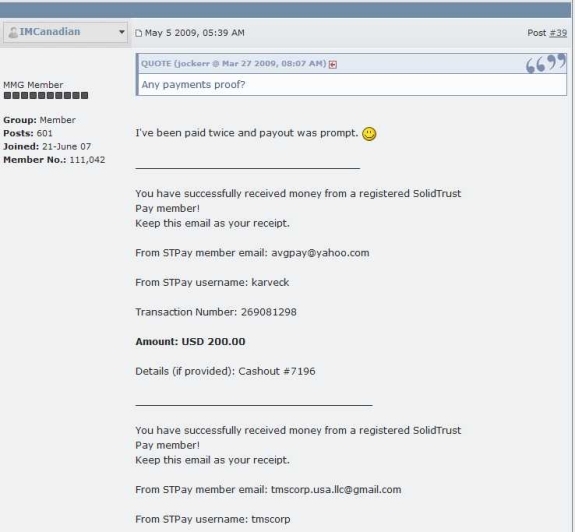 A payment of $200 for AdViewGlobal earnings was received through STP from an STP user who used the acronym “avg” as part of a yahoo.com email address, but did not use an AVG domain, according to the MoneyMakerGroup post. The STP username linked to the AVG payout was “karveck,” not AdViewGlobal or AVG, according to the post. An AVG payment for $1,100, meanwhile, had come from an STP member who used the words “tmscorp” and “usa” — along with the abbreviation “llc” as part of a Gmail address, according to the post. The STP username for the payout was “tmscorp,” not AdViewGlobal or AVG, according to the post. Ten days after the claims appeared on MoneyMakerGroup, the grand jury that indicted ASD President Andy Bowdoin in the District of Columbia was sworn in, according to records. The swearing in occurred just 11 days after the Obama administration announced a crackdown on offshore fraud schemes. On the same day Obama himself spoke about the crackdown — May 4, 2009 — AVG announced it had secured a new offshore wire facilitator in the aftermath of the purported suspension of AVG’s bank account in March 2009. Research by the PP Blog suggests that AVG sought to route money to itself by using a Florida shell company that had sought the services of an offshore firm later banned by the National Futures Association. The seal on the Bowdoin indictment was lifted on Nov. 23, 2010, during a period in which some ASD members were discouraging others from filing remissions claims in the ASD forfeiture case brought by federal prosecutors and the U.S. Secret Service in August 2008. Bowdoin was arrested in Florida on Dec. 1, 2010. He faces an upcoming trial on allegations of wire fraud, securities fraud and selling unregistered securities for his operation of ASD. AVG’s name does not appear in the indictment. Much remains murky about the degree of connectivity among ASD, AVG, STP, Karveck, TMS Corp and EWalletPlus. It is known that ASD and AVG had members and promoters in common. Both firms used STP to process payments, but it remains far from clear how many STP accounts the companies and their executives or insiders controlled and how much money generated in the ASD scheme remained in offshore accounts that later could be tapped to channel money to AVG. ASD and AVG are known to have turned to members and moderators of the now-defunct Surf’s Up forum to sanitize the respective schemes. The surf firms, according to AVG, also shared at least two of the same employees: Chuck Osmin and Gary Talbert. Some ASD members have claimed Bowdoin was a silent partner in AVG and fronted the money to acquire EWalletPlus, AVG’s purported in-house payment processor. If the assertion that Bowdoin provided money to buy EWalletPlus is true, it may mean that the deal was heavily layered to shield Bowdoin from being identified as the funding source and that AVG had more than one silent partner. Karveck and TMS Corp used multiple versions of their names, a potential indicator of money-laundering — i.e., a bid to dupe banks into warehousing fraud-scheme proceeds. Karveck, for example, has been referred to as just plain Karveck, but also Karveck International. Records show that at least three versions of the TMS Corp. name exist: TMS Corp., TMS Association and TMS Corp. USA LLC. TMS Corp. USA LLC is listed in Nevada and Arizona records as using ASD’s address in Quincy, Fla. Its manager is listed as Talbert, the former executive at both ASD and AVG. Each of the TMS firms appears to have a tie to EWalletPlus, which once shared the same server in Panama with AVG. Despite serving pages from Panama, AVG purported to be based in Uruguay and to enjoy U.S. Constitutional protections even though it was operating offshore. Making the situation even murkier is that a penny-stock company known as Vana Blue Inc. claimed in 2008 to own TMS Corp., the parent company of the EWalletPlus web portal, and to have have acquired Karveck International in February 2009. The claims came in the form of news releases — and news releases are common tools in penny-stock frauds. AVG formally launched in February 2009, a year after VanaBlue claimed ownership in a news release of TMS Corp. and EWalletPlus and months after the seizure of Bowdoin’s assets in August 2008. Prior to the seizure, Bowdoin ventured to Costa Rica and Panama, according to court filings by the Secret Service. “Vana Blue was unable to complete this transaction but is in the final stages of negotiation with an oil company to continue its plans of acquisitions,” Vana Blue claimed on Aug. 17, 2009. During the month of August 2009, ASD’s Bowdoin announced in court filings that he was “negotiating” with federal prosecutors. The August 2009 negotiations, which collapsed by mid-September of the same year, marked at least the second time that Bowdoin or his legal team claimed that the ASD patriarch was seeking to find a way to settle the ASD forfeiture case. Bowdoin’s negotiations pleading appeared on the docket of U.S. District Judge Rosemary Collyer on Aug. 4, 2009. Thirteen days later — on Aug. 17, 2009 — Vana Blue announced on Business Wire that its acquisition of Karveck International — a deal it described in February 2009 as completed — had fallen through. Vana Blue claimed in the same announcement it was proceeding on a deal for an oil company despite its sudden loss of Karveck International. Just days before Bowdoin’s Aug. 4, 2009, confirmation that he again was negotiating with prosecutors, Vana Blue’s website suddenly went missing. Earlier this year, a source told the PP Blog that she provided $5,000 to her sponsor — and that the sponsor converted her money to cashier’s checks made payable to TMS Association, one of the “TMS” companies records suggest was tied to both AVG and EWalletPlus. The woman told the Blog that she believed she was a victim of the ASD scheme. On Dec. 21 2010, just 20 days after Bowdoin was indicted, an email that appeared to have originated with an AVG member began to circulate among ASD members. In a possible bid to intimidate ASD members, the email further claimed that an unspecified “back lash” would occur against any ASD member who participated in the claims program. Last month ASD members who filed approved claims forms received back 100 percent of the money they had directed at ASD. The remissions payments were funded by money seized by the Secret Service in the ASD Ponzi case. Although its is believed the government also has opened a probe into the affairs of AVG, prosecutors have made only veiled references to AVG in court filings in the ASD case. Tags: AdSurfDaily, AdViewGlobal, Andy Bowdoin, ASD, AVG, Chuck Osmin, Edna Faye Bowdoin, eWalletplus, Gary Talbert, George Harris, Judy Harris, Justice Department, Karveck, Karveck International, MoneyMakerGroup, penny-stock schemes, Praebius Communications, SolidtrustPay, STP, Terralynn Hoy, TMS Association, TMS Corp., TMS Corp. USA LLC, U.S. District Judge Rosemary Collyer, U.S. Secret Service, Vana Blue, Vana Blue Inc.
Time for a RICO complaint. Round them all up. I don’t know where you got the info that I made ANY announcements as a representative of AVG. I was in the Customer Service Department and was never a spokesperson for AVG. I was involved in the day-to-day operation to help members navigate the software. That’s all I did. If you have any questions about what REALLY went on, you can contact me at the email address above. I agree that you worked in the Customer Service Department. But the statement below also was released under your name. There has been some confusion about an AdView Global banner appearing in the ASD web room and I would like to offer an explanation. When the management team in Uruguay was organizing AdView Global, they were looking for someone who was familiar with the U.S. market and the processes in which to make a surfing company successful. It was for this reason that AdView Global hired Mr. Gary Talbert as their C.E.O. Since Mr. Talbert was and is the C.E.O. for both companies and had worked with the same web room company while at ASD, it would be very natural for him to choose and use many of the same venders that he had used before. So, the fact that ASD and AdView Global are using the same web room hosting company is no accident, in fact it is an operational coincidence. But in spite of this operational coincidence there is no connection between ASD and AdView Global. The idea of two companies using the same web room company to hold training is like buying gasoline for your wife’s car at a gas station and later using the same gas station to buy gasoline for your car. This type of shopping is usually done for convenience and familiarity. The fact that Mr. Talbert did not completely finish making all of the design and name changes on the web room probably meant that he was called away in the middle of making the changes by another pressing matter. But for someone to think that ASD and AdView Global are related just because the old proverbial business name was still on this dormant proverbial building front would be a leap of faith and this conclusion is far from the truth. In any event, Mr. Talbert has now completed all his changes and the web room now reflects the current and only user of this web room. It is unfortunate that an unconfirmed report such as yours occurred and that so many viewers were misled by your story. Mr. Talbert is extremely sorry for the confusion he created by not completing all the changes to the web room at the same time. So once again the only link between ASD and AdView Global is the fact that there are a couple of upper managers who have remained behind to help ASD through its litigation process and are now working for AdView Global. But be assured that there are no corporate or legal links between the two companies. I hope that this clears up the issue and the confusion as to how the ASD web room might have been misconstrued as being part of a new company. If you have any questions please let me know. Ah, c’mon Chuck,give it up. Now you’re pimping JustBeenPaid and fraudulent “reverse pension plans” on your blog.